Heat oven to 375°F. Line large rimmed baking pan with cooking parchment paper. Separate dough into 8 biscuits. Cut each biscuit into 4 strips. Place on pan. Brush top and sides of each biscuit piece with melted butter; sprinkle with 1 tablespoon sugar. Bake 13 to 17 minutes or until golden brown. Cool 5 minutes. Meanwhile, in medium bowl, mix strawberries, 1 tablespoon of the sugar, the vanilla and lemon peel. Let stand 5 minutes. Meanwhile, place remaining 3 tablespoons sugar, the cream cheese and yogurt in medium bowl. With electric mixer, beat on medium speed until creamy and smooth. Spread cream cheese mixture on serving plate. Drain strawberry mixture, if necessary; spoon on top of cream cheese mixture. Sprinkle with mint leaves. Serve dip with biscuits as dippers. 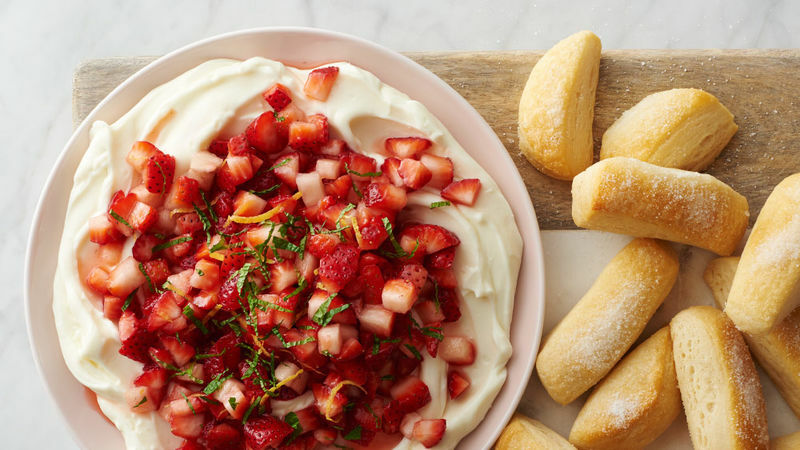 Both the cream cheese mixture and the strawberries can be made and refrigerated, separately, up to 4 hours ahead. Bring to room temperature before serving. For easiest serving, use a spreader or butter knife.